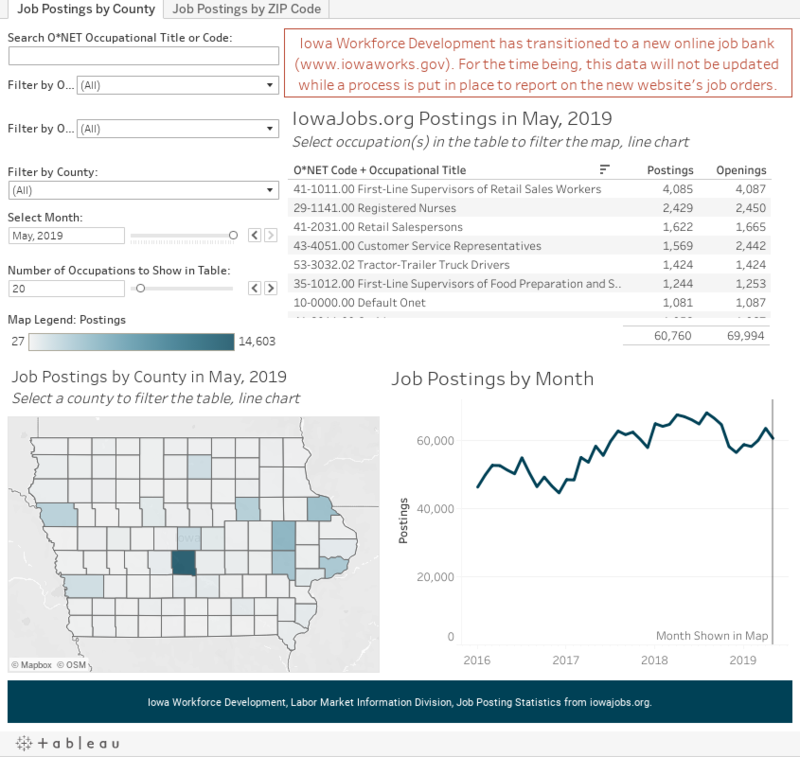 The data on this page are gathered from the job postings that are published on iowajobs.org. The number of postings open each month for each occupation and county are displayed back to January 2016. This information can be used to get an idea of what jobs are being advertised in Iowa, although users need to keep in mind that 1) some types of jobs are less likely to be posted online, 2) there can be multiple job postings advertising the same position, 3) a job posting does not necessarily correlate to an open position, and 4) caution should be used when viewing the data as a time series since changes in reporting between time periods can cause the data to fluctuate and not be representative of true economic activity. Current data can be viewed and explored in the Tableau visualization below. Navigate between county- and ZIP code-level data by using the two tabs at the top of the frame. To customize the view select the occupation(s), geography and time frame from the filters at the left of the table and click apply. As these are adjusted the table, map, and chart will update accordingly. Data for specific occupations are displayed when occupation(s) in the table are selected. Data for specific geographies are displayed when counties/ZIP(s) in the map are selected. Postings are the number of job orders listed on iowajobs.org. Openings are the total number of positions listed (there can be multiple openings listed per posting). The data is also available in CSV files. Click the button below to download the files.